Canada was the first country with substantial nuclear capability to reject nuclear weapons. Canada continues to be actively involved in the international promotion of the peaceful use of nuclear energy. The Canadian Nuclear Safety Commission (CNSC) is responsible for implementing Canada’s nuclear non-proliferation policy. In addition, the CNSC participates in several international nuclear organizations in order to strengthen nuclear safety at home and abroad. On December 17 and 18, IAEA members visited the CNSC to discuss the scope of the mission and define the regulated facilities and activities that will be examined. The Integrated Regulatory Review Service (IRRS) is one of the services offered to Member States by the International Atomic Energy Agency (IAEA). The purpose of an IRRS mission is to compare a country’s regulatory practices with international standards and equivalent good practices elsewhere in the world. IRRS mission review teams comprise senior regulators recruited by the IAEA from other Member States. The review team is accompanied by IAEA staff, who coordinate their activities and provide administrative support. IAEA staff also participate in the review activities. Phase 1: The regulator under review completes a self-assessment based on IAEA safety standards, in order to identify strengths and potential improvements to its regulatory framework and regulatory practices, and to develop an action plan to address identified deficiencies. Phase 2: The IRRS mission is conducted by a review team, who ultimately identifies recommendations, suggestions for improvement, and best practices. Phase 3: A follow-up mission is conducted to assess progress in implementing the recommendations from the initial mission and to identify further good practices. Canada has requested an IRRS mission for 2019 and the CNSC is currently in the self-assessment phase (Phase 1). The IRRS mission will be conducted in September 2019, and the follow-up mission timing will be determined by the review team at a later date. Follow-up missions are typically conducted two to four years after the main mission. At the conclusion of the 2019 mission, as well as after the follow-up mission, a report outlining the mission’s findings will be prepared and made available to the public. A previous IRRS mission was conducted at the CNSC in 2009. An IRRS report was developed and provided a record of the peer review, and the CNSC created an action plan in response to each finding of the review team. Read the IRRS 2009 peer review report and CNSC management response. A follow-up mission was completed in 2011 to evaluate the CNSC’s progress, and review the CNSC’s response to the events at the Fukushima Daiichi Nuclear Power Plant. The team also assessed Canada’s regulatory practices related to the packaging and transport of nuclear substances. Read the 2011 IRRS follow-up mission report and CNSC management response. All actions items resulting from the 2009 and 2011 IRRS peer reviews have been completed. Learn more about IRRS missions. The cornerstone of the international nuclear non-proliferation regime is the Treaty on the Non-Proliferation of Nuclear Weapons (NPT). The NPT establishes commitments to prevent the spread of nuclear weapons, promote cooperation on the peaceful uses of nuclear energy and achieve nuclear disarmament. Canada is an original signatory to the NPT and has centered on the treaty’s provisions. Under the NSCA and its regulations, Canadian importers and exporters are required to obtain and comply with CNSC licences controlling the international transfer of nuclear and nuclear-related items. Licensees must respect Canada’s nuclear non-proliferation commitments. Through the licensing process, the CNSC takes steps to ensure that nuclear imports and exports are consistent with Canada’s nuclear non-proliferation policy. The policy requires major nuclear exports to be subject to a nuclear cooperation agreement between Canada and the importing country. These agreements establish reciprocal obligations that are designed to minimize the risk of proliferation associated with the international transfer of major nuclear items. The CNSC participates with Foreign Affairs, Trade and Development Canada (DFATD) in the negotiation of bilateral nuclear cooperation agreements and implements administrative arrangements with its foreign counterparts to effectively fulfill the terms and conditions of these agreements. The approaches and measures utilized by the IAEA to verify that nuclear material is not diverted from peaceful uses to nuclear weapons or other nuclear explosive devices in accordance with NPT commitments are commonly referred to as “safeguards”. In 1972, Canada was the first country to bring into force a comprehensive safeguards agreement with the IAEA pursuant to the NPT. The safeguards agreement gives the IAEA the right and obligation to monitor Canada’s nuclear-related activities and verify nuclear material inventories and flows in Canada. In 2000, as part of worldwide efforts to strengthen IAEA safeguards, Canada brought into force the Additional Protocol to its safeguards agreement with the IAEA. The Additional Protocol gives the IAEA enhanced rights of access to nuclear sites and other locations and provides it with access to information about nuclear-related activities in Canada above and beyond its rights under the original safeguards agreement. The CNSC is responsible for implementing the Canada/IAEA safeguards agreement and the Additional Protocol. Through the NSCA, regulations and licences, the CNSC implements regulatory controls for the production, use, storage and movement of nuclear material in Canada. Conditions for the application of IAEA safeguards are contained in nuclear facility operating licences. The CNSC performs compliance and auditing activities to ensure licensees’ safeguards policies and procedures remain sufficient to meet the safeguards requirements of the agreement and Additional Protocol. The CNSC maintains a national system that accounts for and controls nuclear materials in Canada, and supplies reports to the IAEA that serve as a basis for IAEA inspection and monitoring activities. The CNSC also cooperates with the IAEA in developing new safeguards approaches for Canadian facilities and contributes to efforts to strengthen safeguards internationally. As part of this effort, the CNSC, through its Safeguards Support Program, assists the IAEA in developing advanced safeguards equipment or techniques aimed at strengthening the effectiveness and efficiency of safeguards implementation. The program also supports domestic needs in resolving specific safeguards issues related to Canadian nuclear facilities and the use of nuclear material. 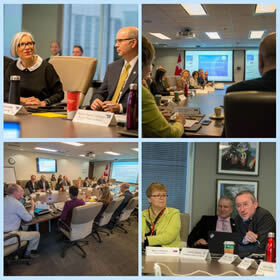 The CNSC participates in a number of international committees and groups as well as international meetings and research projects committed to ensuring the safe, secure and peaceful use of nuclear materials and technology. Membership and participation in these international activities ensure that the CNSC’s regulatory activities are consistent, as appropriate, with internationally agreed upon best practices and principles. Membership and participation also ensure that CNSC guidance, policies and technical standards are current. Through the CNSC’s participation in various international nuclear fora, Canada’s position on nuclear regulatory matters is heard. In 2015, the CNSC gained observer status in the Western European Nuclear Regulators Association (WENRA). The CNSC made the request to become an observer, to promote the exchange of experiences with fellow regulators and learn from international best practices. As an observer, the CNSC will have the opportunity to participate in WENRA's working groups on reactor harmonization and on waste and decommissioning. The CNSC also participates with Global Affairs Canada in two multilateral nuclear export control mechanisms: the Nuclear Suppliers Group and the Zangger Committee. Canada was a founding member of both these bodies. The implementation of the CNSC’s statutory responsibilities for the regulation of Canadian nuclear exports is consistent with the guidelines of these bodies.